Large Floating Charm Memory Locket, available in silver tone or silvertone with rhinestones. This Floating Charm Memory Locket is custom made to your specifications. You chosse the locket and four charms. More charms can be added if you want. 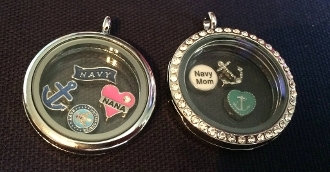 Many charms are available in US Navy or other military themes, family themes, or a mixture of whatever you like. It comes with a FREE silver toned chain so you can wear it right away. These look much better in person than in pictures. FREE First Class Shipping.